Janata Dal (Secular) leader H.D. 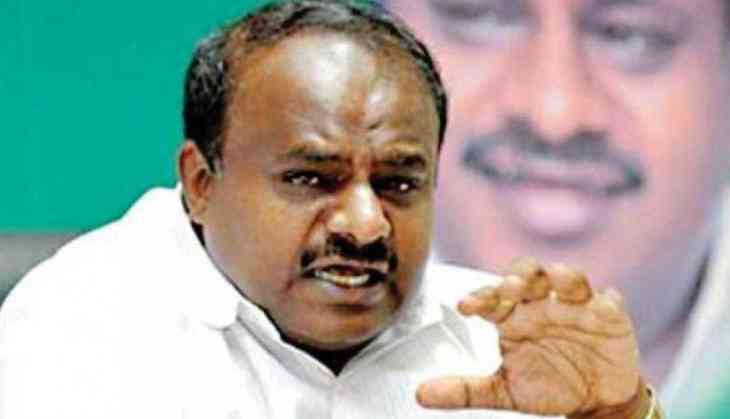 Kumaraswamy is set to take oath as Karnataka Chief Minister at the Grand Steps of Vidhana Soudha, at 4:30 p.m. today. Alongside Kumaraswamy, Karnataka Pradesh Congress Committee (KPCC) President G. Parameshwara will take oath as the Deputy Chief Minister. Governor Vajubhai Vala will administer oath of office and oath of secrecy to the Chief Minister Designate. Minister designates to take oath as well. On the much-awaited day, Kumaraswamy will be leaving for Mysore in the early hours to visit the Chamundi Temple and Chamundeshwari Temple. He will return to Bengaluru by noon for the swearing-in ceremony. A day before, top leaders from Congress and JD(S) met to discuss the portfolio sharing between the allies, and decided that 22 out of 34 ministries would be helmed by the Congress and 12 ministries including the Chief Minister would go with the JD(S). Congress' KR Ramesh Kumar will be the Speaker of Karnataka's Vidhana Soudha, while the deputy speaker will be appointed from the JD(S). Rest of the ministry and portfolio allocation will be decided after the floor test which is due to be held on May 24. With opposition parties across the country extending their support to a non-BJP government in the state, the ceremony is being touted as a grand affair. Among the confirmed attendees are United Progressive Alliance (UPA) chairperson Sonia Gandhi, Congress president Rahul Gandhi, Bahujan Samaj Party (BSP) chief Mayawati, West Bengal Chief Minister Mamata Banerjee, Andhra Pradesh Chief Minister N. Chandrababu Naidu, CPI (M) General Secretary Sitaram Yechury, and Makkal Needhi Maiam chief Kamal Haasan. The high-voltage Karnataka polls were seen as the election that sets the tone for the 2019 general elections, and the Bharatiya Janata Party (BJP), which bagged the highest number of seats, dealt with a heavy blow after the Congress and JD(S) joined hands following the poll results. The BJP that dubbed the union of Congress and JD(S) as an “unholy alliance” has announced to observe May 23 as “Anti People’s Mandate Day”. “The Congress and JDS hijacked the people's mandate and entered into an unholy alliance. On the day this unholy coalition government takes office, that is tomorrow, Wednesday, 23.5.2018, the BJP has decided to observe this day as "Anti People's Mandate Day," an official release from the party stated. The BJP functionaries will stage black flag demonstration throughout the state led by state party president BS Yeddyurappa at the Mahatma Gandhi statue in Bengaluru’s Ananda Rao Circle. Kumaraswamy was invited by Governor Vajubhai Vala on May 19, to form the government in the state, after B.S. Yeddyurappa stepped down ahead of the floor test in the state assembly. Kumaraswamy was earlier expected to take oath on May 21, but the ceremony later got pushed to May 23 due to the death anniversary of former prime minister Rajiv Gandhi. The election result for 222 out of 224 assembly constituencies had resulted in a fractured mandate, with the Bharatiya Janata Party (BJP) emerging as the single largest party with 104 seats, only nine seats short of the simple majority mark of 113. On the other hand, Congress with 78 seats and JD(S) with 37 seats, along with two independent candidates, formed a post-poll alliance with a total of 117 MLAs. However, the Governor invited Yeddyurappa to form a government on May 16, and gave him 15 days to prove majority, amid huge uproar by the opposition. On May 18, the Supreme Court, on the plea of the Congress and JD(S), shifted the floor test to May 19. Unable to garner the required number by the deadline, Yeddyurappa stepped down from the post of chief minister before the floor test could be conducted, mere two days after he was sworn in. Kumaraswamy had earlier served as the chief minister of the state from February 2006 to October 2007. In the recent elections, he won from both the constituencies he contested in - Channapatna and Ramanagara - by a comfortable margin. JD(S) ally, Congress bagged more seats out of the two, but its chief ministerial candidate Siddaramaiah lost the Chamundeshwari seat to G T Deve Gowda of JD(S) and won in Badami only by a little over 1,600 votes. The hung assembly in Karnataka led to an unlikely alliance of the two rival parties, but both sides now maintain that they have set aside their differences in the people’s interest.